We believe in training that combines workouts and exercise with the incredible joy of learning and fun of the game. 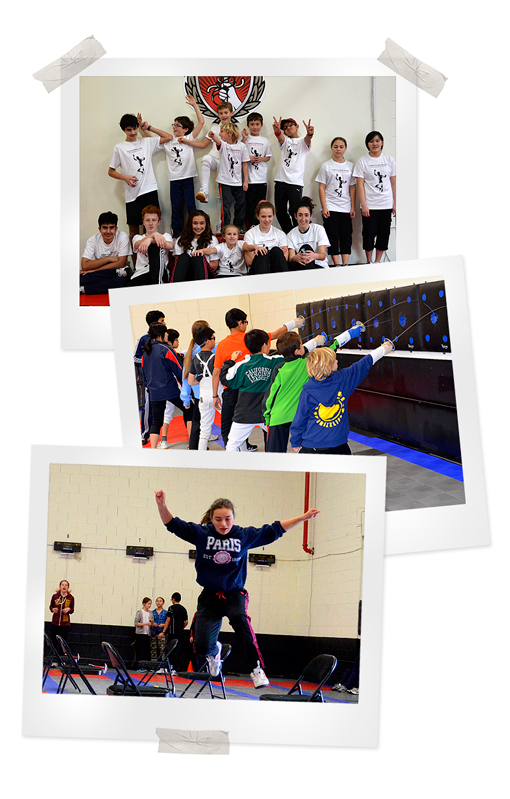 Our fencing camps and classes engage and motivate young people so that time flies and keeps them going on. Beginners will be amazed at how much they learned and improved their conditioning and fencing skills. Our summer camps will be one of the highlight of your child’s summer school break. They will learn fencing, play fun and engaging developmental sport games, make friends and will have an incredible fun. They will come home tired and hungry from the daily activity, and all they will talk about on their way home and at the evening is who they scored touches against, how they tricked their opponents and how many wins they had. They would hardly wait till the next morning to return to their summer fencing camp. That’s our experience and that’s our promise. Beginning fencers will acquire basic fencing skills, including footwork, blade work, and distance control, they will fence with electrical equipment and understand fencing etiquette, rules and sportsmanship. Of course, not everyone will chose fencing as their livelong sport after the camp, but everyone can claim that they know what fencing is and why it is a super cool sport. We run fencing summer camps in our two San Francisco Bay Area locations: in Campbell, CA or in Sunnyvale, CA. Our facility in Sunnyvale is one of the biggest fencing clubs in the United States. In addition to beginner fencing summer camps we also conduct camps and clinics for experienced fencers, from intermediate to highly competitive. Every such fencing camp is designed to meet specific needs and requirements of the camp attendees. We are really honored to build a tremendous coaching team of world class and internationally recognizes coaches. It’s wonderful to see fencers learning and growing under the tutelage of these experienced and supportive coaches. AFM coaches have all kind of medals under their belt, they trained national teams, helped fencers to qualify to Olympics and they are true fencing masters. They are inspiration for all of their students. Part of the huge success of our training programs is our coaches great experience in tailoring training to specific level of skills and needs. Their short biographies are listed here. Following is the list of fencing camps we host in 2018: summer camps for beginners and competitive camps for advanced fencers. To register to any Beginner Fencing Camp, go to the Beginner Fencing Camp page and click the “Register” button. AFM Summer Camps are designed to improve fencing technique and general conditioning of fencers during the summer and start a new season on a high note. We run two type of camps: for Foil fencers (Intermediate to Advanced level) and Epee fencers (all levels). AFM Foil Camps are designed for Intermediate and Intermediate-Advanced fencers that want to improve their technique tactical understanding and fencing stamina during the summer. AFM Epee Camp (Back to Season Camp) is designed for epee fencers that want to improve their technique tactical understanding and fencing stamina during the summer. Detailed description, dates, times, prices, and discount information on each camp is provided on its separate page.